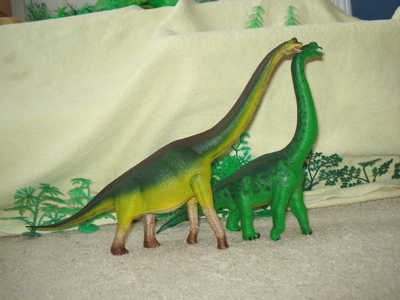 The original Wild Safari Brachiosaurus came out as part of the initial series in 1996 and was, at the time, a reasonably well done figure. 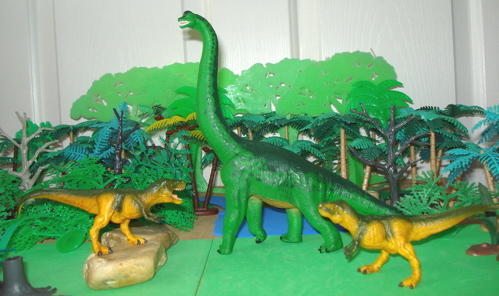 Presented in a green-on-green color scheme this was an excellent addition to the Wild Safari Dinosaur toys menagerie. 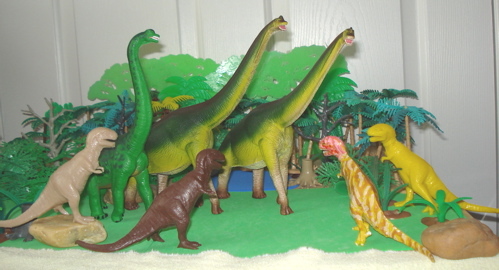 However, beginning in 2006, Wild Safari has changed its tack and began recreating their lineup with brand new and highly realistic Dinosaur toys. These new, post 2006 figures have lost their toy-like qualities and become what have to be considered as top of the line museum-quality pieces. Ranging from the totally redone Allosaurus and Tyrannosaurus figures to utterly new Scutosaurus, Velociraptors and many, many more. Safari Ltd. (Opens new window) is both replacing old favorites and creating new ones. I would like to take this opportunity to thank the kind folks at Safari LTD. for their help, without which this page would not have been possible. 2008 saw the introduction of a completely new Brachiosaurus from Wild Safari, one that is elegant in appearance and more naturally colored in browns and greens. 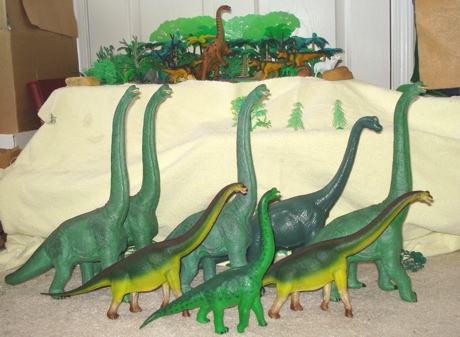 The 1996 Brachiosaurus was thirteen and a half inches (13.5", 34.25 cms) and 1/73 scale (based on 82 feet for an adult) while the new one is fifteen and a half inches (15.5", 39.25 cms) in length, 1/63 scale and weighs in at one-half pound, eight ounces (8 oz, 372 gms). As can be seen in the photo at the top of the page and the two below, the differences between these two Safari Brachiosaurus are quite significant. 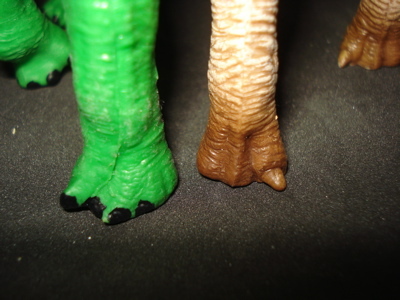 In both versions the feet are well done (below- front left, rear right) and and highly detailed, moreso in the 2008 model. 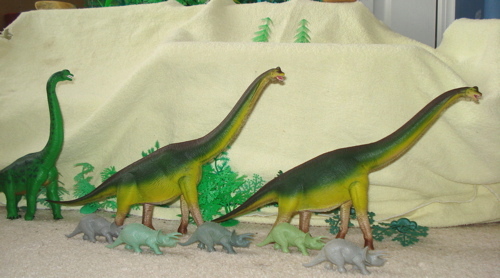 These work as either adult Brachiosaurus Dinosaur toys standing on their own or fit in to herds with the significantly larger Carnegie or/and Invicta Brachiosaurus, serving the role of "teenager" as required. To the right we see the Carnegie Brachiosaur in the rear, then the Invicta, 2008 Wild Safari and in the front, the 1996 Safari Brachiosaurus. 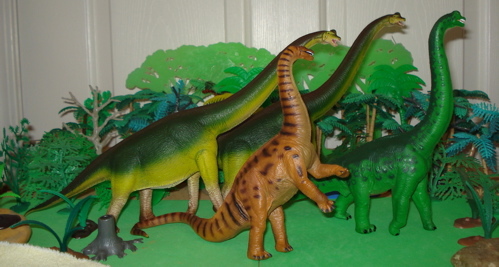 1996 also saw a Wild Safari Apatosaurus produced in an upright posture similar to the iconic Battat Diplodocus. 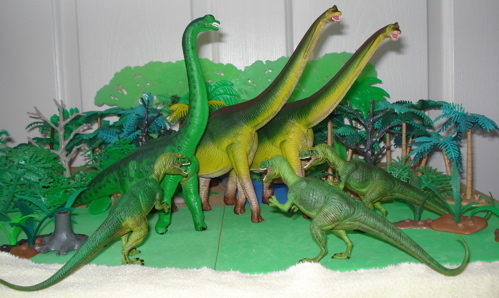 Seen below with our herd of "teenage" Brachiosaurs. including, of course, the fabulous Marx "sleek" T-Rex (below). 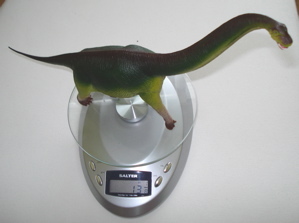 But given that most of the nicest Dinosaur toys today are being made in 1/30-40 scale (The Carnegie Collection and Battat are in 1/40, while PAPO and Bullyland are a tad closer to 1/30.) and these will serve as 'juvenile' or 'teenage' members of a herd. One thing you need to consider is that a herd of these huge (adults were, minimally, over 80 feet in length and potentially weighed as much as 80 tons) Brachiosaurus could and would defoliate an area rather quickly, requiring them to "move right along, there's nothing left to eat here." This effectively meant that a clutch of eggs could not be tended until the birth (hatching) of the 'newborns' and the hatchlings would be left to survive on their own. These 'newly-hatcheds' would eventually have to find a herd to join or they would find themselves as prey. A herd of these (adult and sub-adult/teenaged) behemoths was effectively immune from attack (just as a herd of modern day elephants), but juveniles would be vulnerable. This would also serve to create an increased level of genetic diversity by mixing the genes from different herds. While the small hatchlings would tend to stay in the jungle/forest where they could hide from predators in the undergrowth as they grew larger they would need to seek out adult herds. 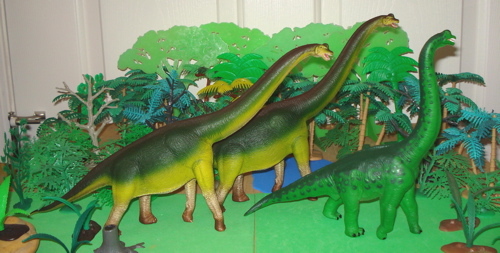 Above we see a lone Wild Safari Brachiosaurus being harassed by a 1996 WS Tyrannosaurus (green) and one of the last of more toy-like WS figures, a 2004 Gorgosaurus. For a young Brachiosaurus being caught alone is just a short step from becoming an entree. 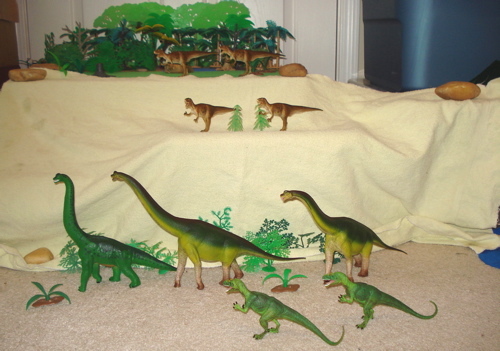 2004 also happened to be the year that one of my favorite small Dinosaur toys was created, the also out-of-production Safari Ltd. "SUE" T-Rex for the Field Museum of Chicago. There were two-Sue produced (and there will be a page on them coming up) one with her mouth closed and the other with the mouth open. They are particularly nice and quite small at five and a half inches making them ~1/98 scale. 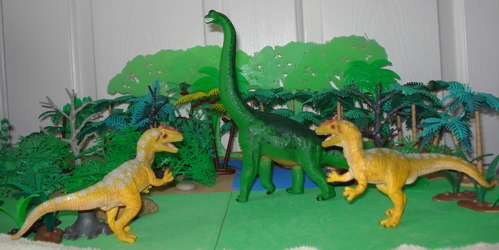 The following photos show a pair of "Sues" (playing juvenile Tyrannosaurus) threatening the 1996 (in the top picture) and 2008 Safari Brachiosaurus (bottom). 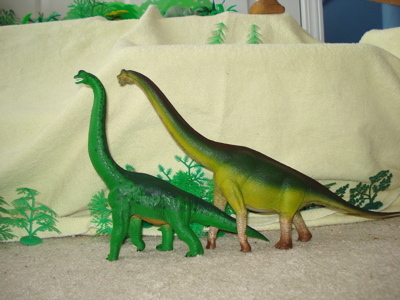 Sue's skin coloring is quite similar to that of the newer Brachiosaurus. Several things are clear from the above photos. 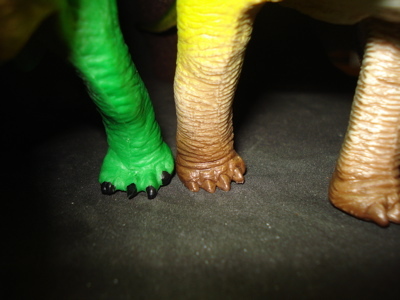 The first is that the the feet are well detailed. A second is that the 2008's tail tapers down more than the earlier figure's. The Brachiosaurus had a long neck and front legs allowing it to browse in foliage over forty feet above the ground. Its tail was considerably shorter than that of, for instance, the Diplodocus and was less of a weapon. Its pure size and herding instincts provided all the security it required. 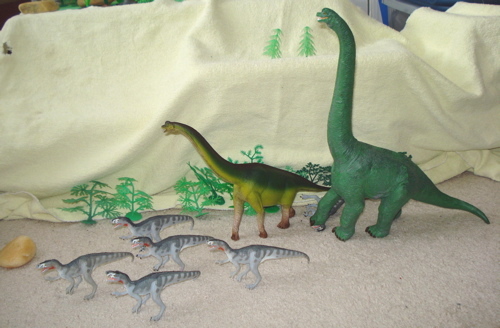 Searching for an adult herd to join our young Brachiosaurus herdlings are getting quite upset. 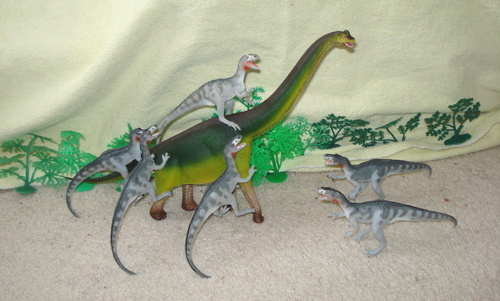 They have been stalked by this pack of Deltadromeus ("Delta-runner," a fast Theropod Dinosaur toy. These being plasticivorous, from the Carnegie Collection.). 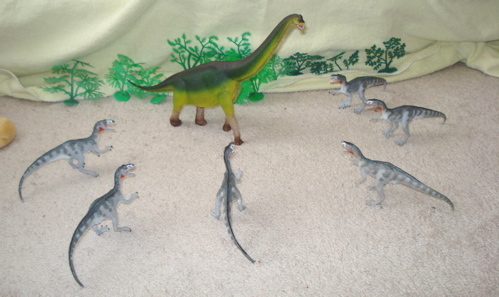 They have driven off both the Sinraptors and the outnumbered Allosaurs and are now growing bolder by the minute. clearly state the Dino-name (Brachiosaurus), manufacturer (Safari Ltd- Miami, FL), country of manufacture (Made in China) and the c-1996 & c-2008. The close up of the tummies shows the difference between the two in microcosm. The colors of the 1996 are bolder and the details less subtle. 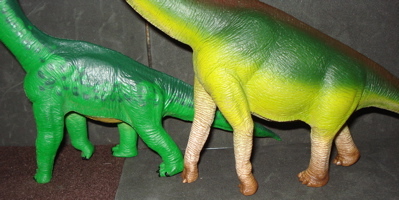 The texture of the skin for the 2008 Brachiosaurus extends across every millimeter of the figure and the hand painted coloring is applied with far greater attention to detail. In both cases there is the now ubiquitous EuroUnion required "CE" indicating a lack of toxicity (if those Deltadromeosaurs had gotten their meal they would have found it safe to eat) and the newer model (as will all plasteontologic creations in the future) has passed a battery of USA congressionally mandated CPSC (Consumer Public Safety Commission) testing, verifying that these can be taken intravenously with no harm (although that would tend to hurt a lot I suspect) to the recipient. 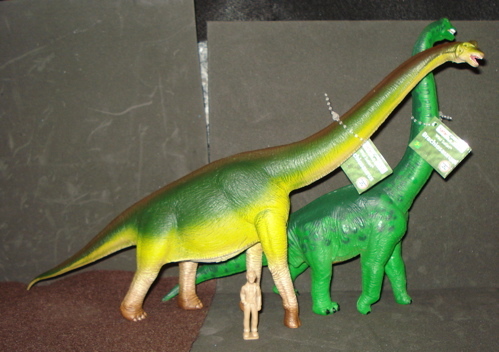 The 1996 Brachiosaurus is no longer being produced but remains available in both retail stores and online venues, prices ranging from $5.19 to $7.99 (online, plus shipping and possible tax). While a really nice Dinosaur toy, it is really just that. The new version, introduced in 2008 but just released for 2010 (I really can't explain it myself) is head and shoulders above the earlier offering. 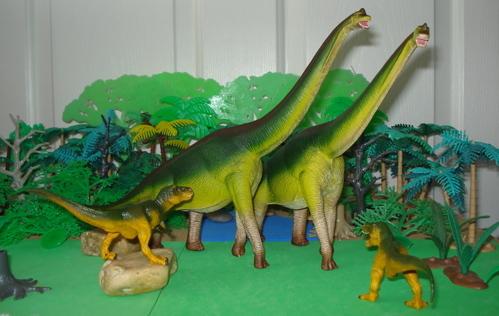 With its far more graceful lines, natural posture (with the head and neck more forward as opposed to the earlier extremely upright, telephone-pole position) and excellent detail and coloration the 2008 model has become THE Brachiosaurus to get. While it is far to soon to speculate on either of these becoming 'collectible' they are both worthy of membership in anyone's collection. The new model is selling for approximately $14.00. 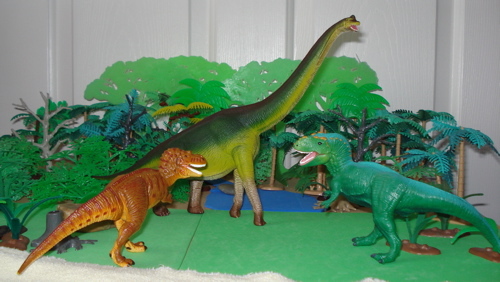 This is probably the THE best Brachiosaur Dinosaur toy on the market today. 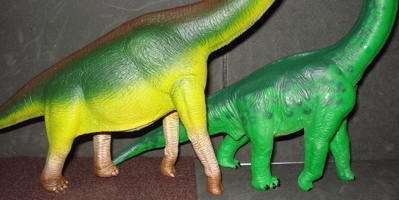 Safari has taken their Wild Safari Dinosaur toys line up to an entirely new level with "realism" in terms of (museum quality) detail and lifelike coloration. It is a shame that they are not also being produced in a constant scale as they do with their Carnegie Collection. This figure, blown up to the size of their Carnegie Brachiosaurus, would just knock your socks off. 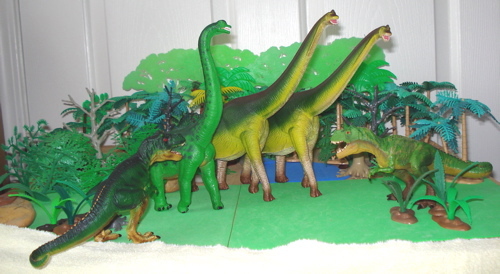 You have been reading the Wild Safari Brachiosaurus page of the Dinosaur Toys Collectors Guide. 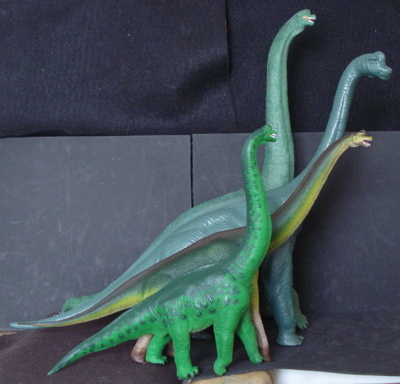 To return to the main Sauropods page please click anywhere along here, thank you.